Weekly Meal Plan Week 2 of 2016 and every recipe is not only a healthy family friendly recipe, but each recipe is also paleo friendly as well as gluten free. Each featured recipe includes link to complete recipe. So you have decided to eat Paleo, or maybe you have been and you need some new delicious recipes to try out. 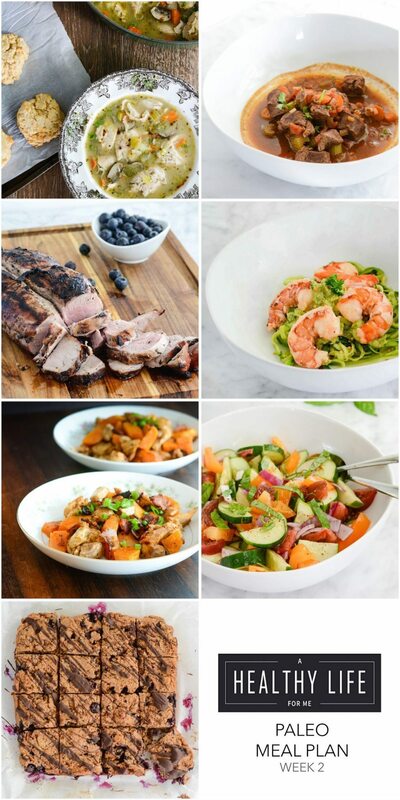 Here are seven paleo friendly recipes that are perfect for the home cook. All the recipes that I have included are easy to make and are family friendly. What is Paleo? In a nutshell, the Paleo diet is based on the notion that for optimal health, modern humans should go back to eating real, whole unprocessed foods that are more healthful than harmful to our bodies. I have eaten a mostly paleo version diet for over fifteen years and can attest based on my own personal experience to the effects it has on your mind and body. Each recipe listed below includes a link to the full recipe and a complete shopping list that includes the ingredients for all the recipes can be found at the end of this post. Paleo Lamb Stew is super simple to pull together and loaded with fall spices to give you a zesty, comforting, healthy, clean meal in one pot. Blueberry Grilled Pork Tenderloin is a simple and delicious dinner recipe that is gluten free, dairy free, paleo. Zucchini Noodle Shrimp Scampi with Avocado Sauce is the perfect quick, healthy dinner that is ready in less than 30 minutes. Gluten Free, Dariy Free, Paleo friendly. Sweet Potato Spicy Chicken is a recipe to impress. A dinner recipe that is easy, and packed full of rich flavor that is sure to make the whole family happy. Gluten Free, Dairy Free, Soy Free and Paleo. Tomato Cucumber Salad with Avocado Vinaigrette is a rainbow of fresh summer produce. An assortment of garden fresh tomatoes, sliced cucumber, red onion, basil topped with a homemade avocado vinaigrette.